This act is from my hometown of Rockford, Illinois. They have a sound that feels more European to me, though. This isn’t all heavy metal, but enough of it is to qualify. There’s some range within that, though from melodic epic metal to progressive rock, NWOBHM and much more. This is a strong effort for sure. A keyboard based piece, this might lead one to believe that the disc is a progressive rock album. Coming out of the previous number, the metal fires off right out of the gate. It drops to a mellower, again proggy, section for the first vocals. The choruses are powered up. This sort of walks the fence between melodic metal and progressive rock. In some ways it reminds me of Fates Warning quite a bit. Although still on the melodic end of the scale, this is more pure metal. It’s rather screaming in a lot of ways. There are hints of NWOBHM to me. It’s a strong cut on a disc full of strong material. More like a metallic power ballad in some ways, this is slower and a bit mellower. The NWOBHM reference is definitely valid here, too. It does intensify into a pure rocker later, though. The first verse of this is built over the top of an intricate acoustic guitar sound. This really does become a metal ballad. It gets crunchy on the choruses, though. This is less of a pure metal tune than some of the other stuff. That said, it has a progressive metal vibe. The arrangement and song structure are less predictable. It’s a strong tune and a nice change of pace. Another with definite progressive rock elements, this brings epic metal and more to the table. The chorus reminds me a bit of early Queensryche, but the verse feels a little awkward at times. This is very much a metal ballad. It feels like something that might have come out in the 1980s in a lot of ways. It gets crunched up later in the track, but remains quite mellow for a good amount of time. In fact, while a lot of the album makes me think of Skid Row, this really sounds like that band to me. Some of the music on this makes me think of Dio. That said, this is a less traditional metal song, moving into some more creative directions. The mellower keyboard based verses bring it closer to the prog end of the spectrum. Starting with a mellow section, this one gets into harder rocking sounds later. It’s another solid example of the kind of music this outfit delivers. This cover is good. 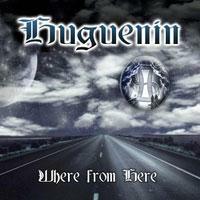 It’s definitely recognizable as a QR song, but Huguenin bring their own style to it, too.